I and one other councillor voted in favour of allowing the application to proceed. (There was no guarantee it would succeed, just that it would move forward in the multi-stage process.) I’ve been asked about why i voted as i did, in this time of housing shortage. Here’s my reasoning. Think of where in the downtown core you consistently see people gathered outside in a social context. For me, four places come to mind. One is good ol’ Co-op corner, because everybody goes to the Co-op anyway and there are at least a few seats there to linger on. The other three are deliberately constructed gathering places on Campbell Street. ¶ The sizable deck at Tuff Beans Coffee House (above), on the main downtown intersection, is about as inviting as it gets, rain or shine, and always has people on it. ¶ The sidewalk “patio” outside Rhino Coffee House faces south and is a hugely attractive spot to linger on a nice day. Its only downside is that it is so constricted. If it were three times the size, there would probably be three times the people hanging out there. 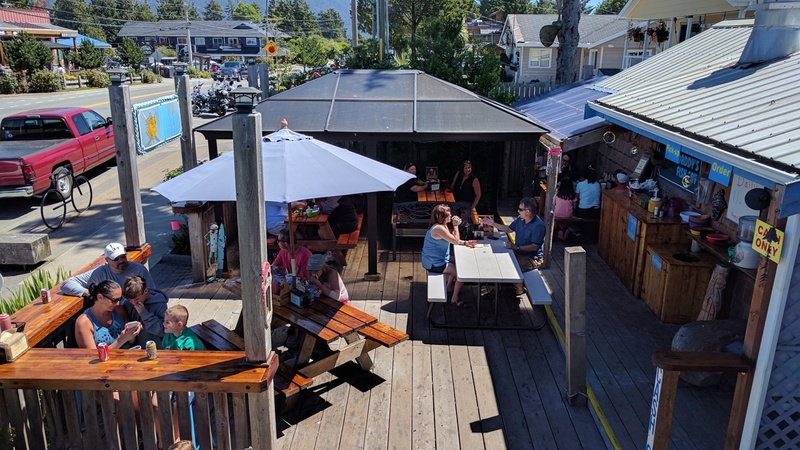 ¶ And the deck at Big Daddy’s Fish Fry is packed like a sardine can at mealtimes, and always seats at least a few folks any other time the weather’s suitable. Thing is, people love sidewalk culture. It animates the heck out of a streetscape when people can enjoy their food or coffee and still be part of the “scene.” Many European cities are famous for this, and places like Montreal have followed suit with a vibrant street culture. 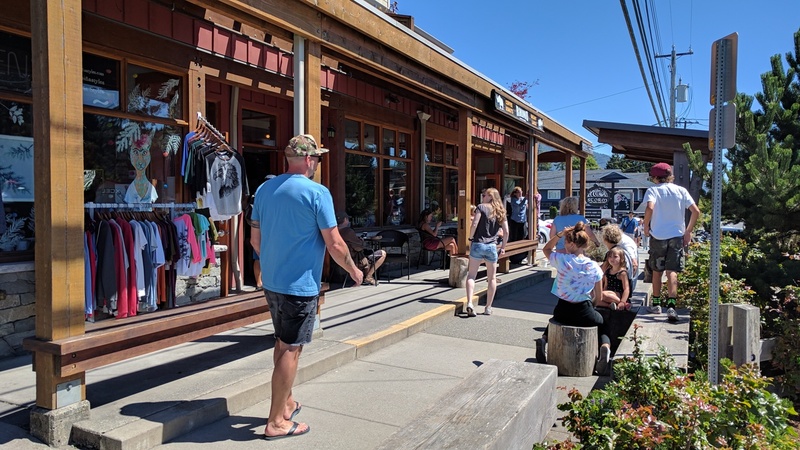 These three Tofino gathering places are all on one block of Campbell Street, and they’re a good part of the reason why it’s the liveliest block in the downtown core. Main Street is a few years behind. We’ve just spent hundreds of thousands of dollars making it much more pedestrian friendly, with wide sidewalks, landscaping and reconfigured parking, to entice more foot traffic to the waterfront and its businesses. It’s a huge success in my (admittedly pedestrian-centric) view. But at present, it’s still missing the gathering places to animate it. Now take a look at that parking lot in front of The Shore. The sidewalks to the east and west both run smack into this pedestrian black hole. But imagine that it were a big walking plaza, with benches, restaurant tables, food carts, busking spots, and pop-up craft shops, some under fabric “tent” roofs for shade and shelter from rain. What a fabulous space that would be, with it’s all-day southern exposure — a jewel in the Main Street walking experience. But what about all that business parking?, you might well ask. Thing is, the parking can be readily moved away from the building and out to the street line, freeing up all that space next to the building for, well, all the accouterments of sidewalk culture. A preliminary design already exists for this, with little or no loss of parking. How could we make this happen? Realistically, there’s only one way: through an amenity given by The Shore. Amenities are essentially a trade, where an applicant for rezoning gets something it wants, and the district gets something it wants in return. In this case, The Shore wants nightly rentals. I’ve spoken with them, and they are open to at least talking about putting a plaza in front of the building. So that’s why i voted to move the process forward, even in the face of converting residential units to nightly STR. I really think such an amenity would be priceless for Main Street. Other councillors, for good reasons of their own, voted the opposite, and the motion to proceed was defeated. So the idea is down for now, but it’s not dead. The Shore owners could return, likely in a few years with a new council, to try their luck again, with a plaza or perhaps different amenities on the table. If that council were open to the idea, a negotiation could take place, moving perhaps to public input, where all Tofitians could weigh in on whether the trade-offs were worth it. I for one hope it does move ahead eventually. I look forward to walking the length of Main Street on a warm summer day, and stopping for an oyster, a cider and a visit with friends on that plaza of possibility. Tofitian greg blanchette is a longtime observer of our fascinating little town and its culture. He volunteers with several non-profits and also sits on town council, which has been an eye-opening experience. This entry was posted in council and tagged planning by greg blee. Bookmark the permalink.